The Most Reverend Joseph W. Tobin, C.Ss.R. 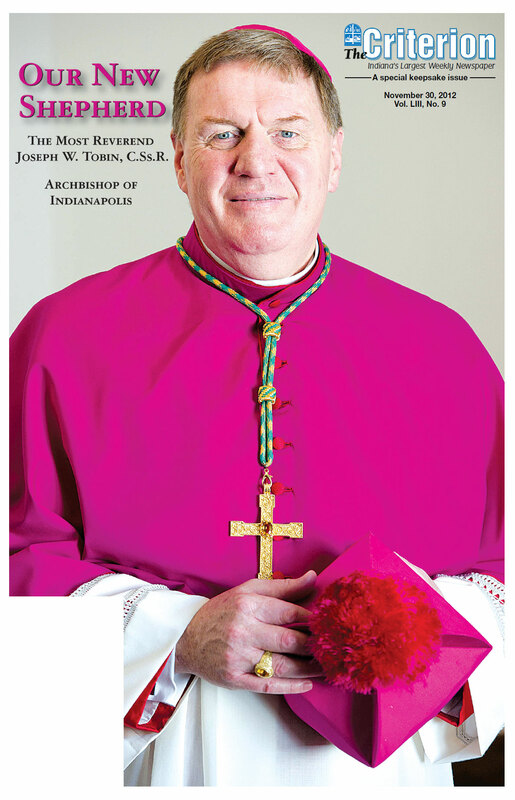 The November 30, 2012 edition of The Criterion is a special keepsake issue meant to help readers get to know Archbishop Joseph W. Tobin on a more personal level. From family and friends to colleagues, to former parishioners and brothers in the Redemptorist order, people share their firsthand experiences with our new shepherd. Click on any of headlines to read more. co-workers in ministry. These stories explore various facets of the archbishop's life to this point. Archbishop Joseph W. Tobin will be installed as the sixth archbishop of Indianapolis at a 2 p.m. Mass on Dec. 3 at SS. Peter and Paul Cathedral in Indianapolis. The rites involved in his installation will actually begin the previous evening during the praying of a Solemn Evening Prayer for the First Sunday of Advent at 5 p.m. in the cathedral. Learn more about the installation below. Here is a series of his reflections and insights on a wide range of topics—from Archbishop Tobin's views on coming to Indianapolis to the role of lay women in the Church, from his thoughts about growing up in a family of 13 children to his strong belief in Catholic education, from his reflections on the importance of a sense of humor in the spiritual life to the need to reach out to teenagers and young people in faith. Here are a few more details about our new archbishop, and where you can go for more. Description of the coat of arms of Archbishop Joseph W. Tobin, C.Ss.R. In preparing for the installation of Archbishop Tobin, The Criterion also looked at the history of the archdiocese and its bishops, as well as who a bishop is in Catholic theology and how they're chosen. If you'd like, you can download our entire 56-page keepsake issue in PDF format to see how it was presented in print. The file size is about 40 MB, so even on a high speed connection it will take a minute or two to fully download.